Tanya Hudson is the school librarian at Chase Street Elementary School in Athens, Georgia. As part of Library Card Sign-Up Month, she was one of several school librarians in the Clarke County Public School District who arranged for their students to get library cards at the public library. Mrs. Hudson wrote about her school’s participation on her library blog, the Tree Frog Blog! During the Night at the Library event, 14 students and their families visited the recently renovated Athens Clarke County Public Library for fun events including a library tour, a raffle, and of course, new library cards. After receiving their new cards and selecting some books, the students were thrilled to be able to scan their new library cards at the self-checkout stations. (I agree that the self-checkout stations are fun to use and so convenient!) The Night at the Library is just one of many library reading promotions at Chase Street. Every fall they have an event called the Reading Tailgate which occurs at one of the apartment complexes in town where many of the Chase Street students live. It’s a drop-in event in a big, open, grassy field. There are many activities for the students to do at different literacy stations including make-and-take centers and a used book give-away. The walls of the Orchard School Library Media Center faded away last week as young learners from South Burlington, Vermont met with friends in several elementary schools across the country via Skype and Google Hangout. As participants in the Global Read Aloud project, readers throughout the United States and beyond read and discuss books both synchronously and asynchronously for six weeks beginning in October. 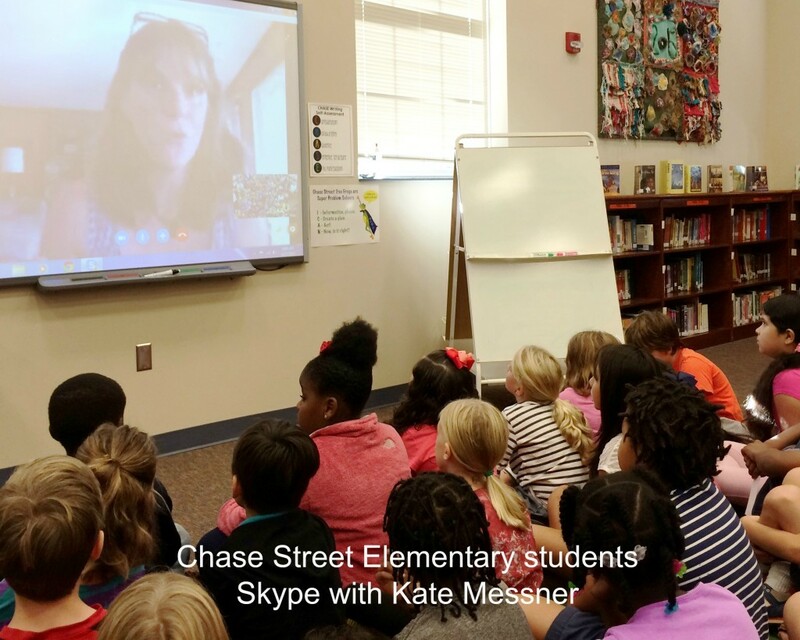 Educators who jump into the Global Read Aloud are encouraged to find creative ways to incorporate the joys of shared reading both locally and globally. Through the GRA website and wiki, teachers and librarians can collaborate with each other and their classrooms through Twitter, Edmodo, Skype, Kidblog, and other social media sites. 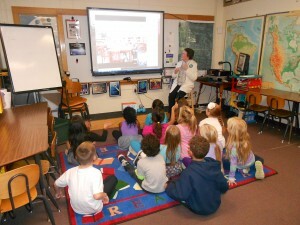 The project began in 2010 with a Wisconsin educator, Pernille Ripp, who envisioned a read aloud that would connect kids and books beyond the classroom. The program has grown exponentially, from 150 in 2010 to over 300,000 student participants from over 60 countries in 2014. The GRA 2015 has kicked off with four middle grade titles for discussion this year, and an author study for the picture book crowd. When I visited last week, Donna read another book by Rosenthal, It’s Not Fair, to a class of second graders, and explored concepts about fairness and taking turns by arranging for two activities for the class. The object was to make sure that all had equal time for the activities. Fifteen minutes before the end of the class time, the students got together via Hangout with their buddy class in Indiana to discuss the book and ideas about fairness. It was amazing to see the Orchard students actually having an interactive discussion with kids miles and miles away. In August, Donna contacted Phoenix Books in Burlington and suggested that they could work as partners to contribute to the food drive for the Chittenden Emergency Food Shelf. “The fifth grade teachers read Crenshaw as their first read aloud this school year. In the library, we researched childhood hunger and presented this information on posters, created in both in the makerspace and on the computer. Students also created a slide show on childhood hunger and ran a whole school morning meeting introducing the food drive to the school. There were speakers from both Phoenix Books and the Chittenden Food Shelf. No teachers spoke. It was student driven. 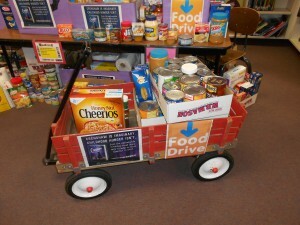 Heading into the final week, we’re at 819 items donated! Back to Crenshaw, many 2nd through 4th grade teachers have since read the book to their classes. I have used Amy Krouse Rosenthal’s message about random acts of kindness in my discussions with K-3 students who are reading her books. On Friday, after reporting final totals to the school at morning meeting, one fifth grade class will load all of our donations on a bus and we’ll head to the food shelf for a tour and a weighing of all the donated food. It’s heartwarming to witness the kindness and empathy shown by young children through participation in this project. For Donna, and the many other talented teacher librarians and educators in our schools, celebrating literacy is an everyday joy that is embedded within the fabric of a culture of collaboration that makes a school a vibrant and caring place for our students and our colleagues. Thank you Donna for sharing your enthusiasm and energy, and thank you to your students who are making a difference locally and globally! Applegate, Katherine. Crenshaw. New York: Harpercollins, 2015. Kaplan, Judith. “Donna Sullivan-Macdonald.“ Personal Interview and email correspondence. 20 Oct. 2015. Orchard School Library Media Center, 2 Baldwin Ave. So. Burlington, VT 05403 Web. 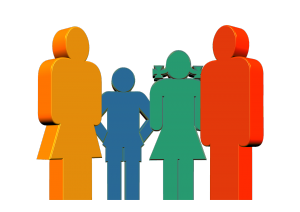 Oct. 25, 2015.<http://library.sbsd.orchard.schoolfusion.us/modules/groups/integrated_home.phtml?gid=771938>. Ripp, Pernille. “Home.” GlobalReadAloud. Wikispaces, 2015. Web. 26 Oct. 2015. 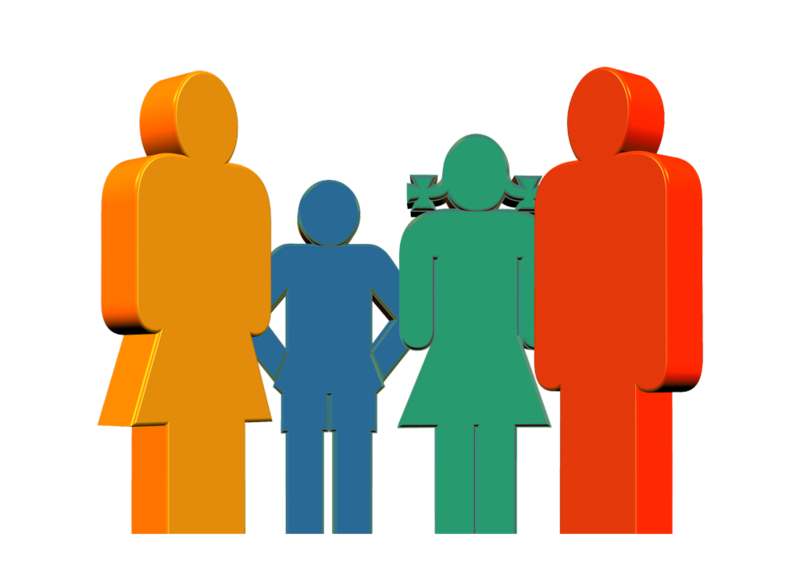 <http://globalreadaloud.wikispaces.com/>. When my colleague Lucy Santos Green asked me to write a post for her while she did research in Brazil, I began reflecting on the theme for this month: collaborative reading promotions and literacy events. I teach courses in the school library media concentration in the Instructional Technology program at Georgia Southern University in Statesboro, Georgia. In my work it’s important to me to keep up with what is happening in the school library field, but it’s been eleven years since I worked as an elementary school librarian and my experience in such matters is definitely outdated. Linda Martin, who is the school librarian at Sugar Hill Elementary School in Hall County, told me about a summer reading program she has been involved with for the last three years. The program was developed in response to a problem; during the summer many students in Hall County do not read because they do not have transportation to the public libraries. In order to avoid the summer slide, county media specialists working with school personnel brainstormed to find a way to get books to these students. The solution was the Reading Rocket, a bookmobile created from a school bus which the school system donated for this use. 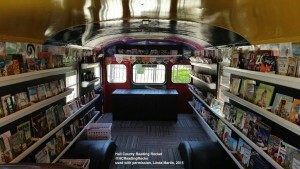 The bus was retrofitted by students in a high school shop class who painted it with bright colors and installed gutters to hold the paperback books from Scholastic. 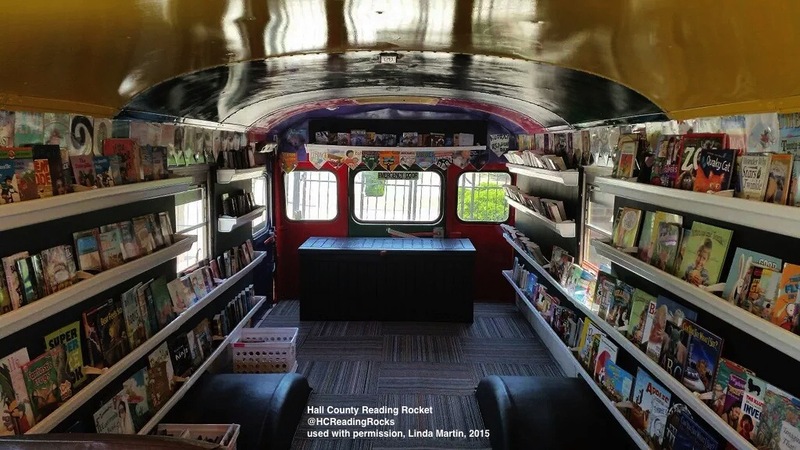 The Reading Rocket operates two days of the week during the summer, traveling to schools, community centers, and trailer parks to bring books to children. The bookmobile is staffed mostly by volunteers: teachers, principals, media specialists, teachers, and even some students who enjoy helping their friends find books to read. Now in its third year, the Reading Rocket is just one part of a year-round reading program developed by a collaboration between Hall County Schools and the public library. You can read more about this innovative reading project at the Reading Rocks website and you can follow them at Twitter @HCReadingRocks. Cooperation and Company was a Dewitt Wallace-Reader’s Digest Library Power grant-funded project. Two public library children’s librarians, Mary Margaret Mercado and Char Maynard and two school librarians, Terri Moschetti and yours truly, collaborated to co-author, co-promote, co-produce, and co-celebrate three puppet plays. We worked in public librarian-school librarian teams to develop the puppet plays based on three public domain stories from traditional literature: Borreguita and the Coyote, Whale in the Sky, and Whose’s In Rabbit’s House? We purchased the puppets, created the scenery, and used the then Tucson-Pima Public (now Pima County Public) Library’s professional puppet stage. We had a blast! We performed the plays at two branches of the public library and at both elementary schools. 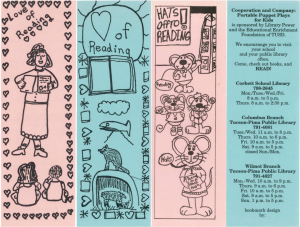 We involved students in bookmark contests to promote the plays and the hours and contact information for the libraries. 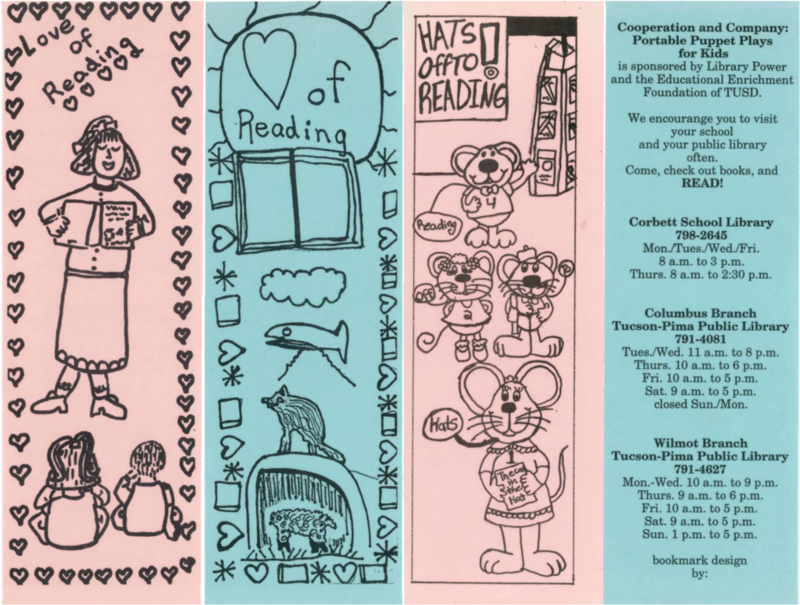 (See above selection of bookmarks, circa 1995.) Students also learned the puppet play refrains so they could assist in the performances. Mary Margaret and I continued to perform Borreguita and the Coyote for the public library’s summer reading program for many years after the grant project. 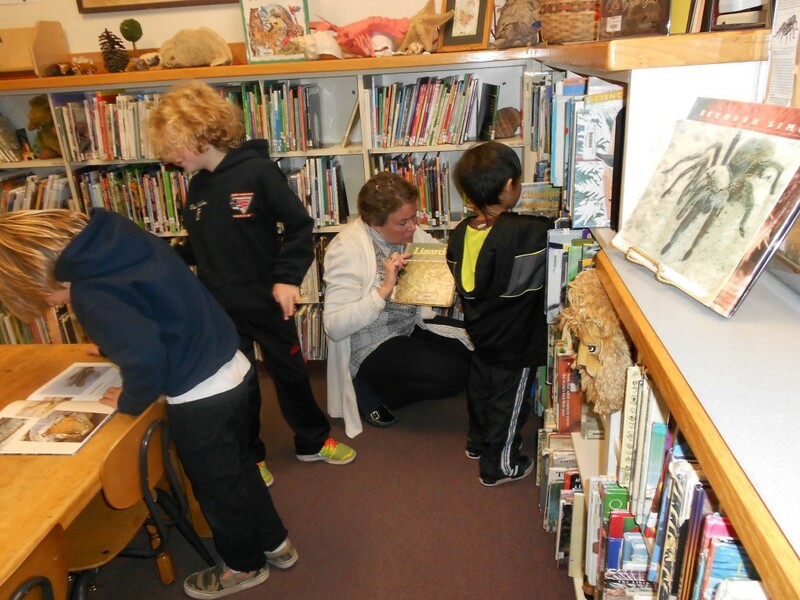 School library and public library collaboration can be a rewarding and high-impact activity for all involved. While the school librarian’s support for the public library programs during summer reading is essential (especially if our school libraries are shuttered during the summer months), we can make the extra effort to involve students and families in taking advantage of what the public library has to offer year round. School librarians collaborating with our colleagues at the public library is a win-win for the readers in our shared communities. This month the BACC cobloggers will share ideas about collaborative reading promotions and literacy events. While every school librarian strives to make the library the hub of learning, we also know that it takes a whole-school approach to supporting students as they engage in literacy for the 21st century. Enlisting all members of the school community in promoting reading is necessary. And as this video demonstrates, it’s fun! Stony Evans is a library media specialist in Hot Springs, Arkansas. He collaborated with Lakeside High School (LHS) coaches Joe Hobbs and Karrie Irwin to co-develop the “Train Your Brain Ad” video starring the LHS Cross Country Team. Lakeside Superintendent Shawn Cook made a cameo appearance in the video. Kevin Parrott was the videographer. Congratulations to the whole team at Lakeside High! This is one example of how library leader Stony Evans is reaching for his goal “to create lifelong learners through literacy and technology.” Visit Stony’s Library Media Tech Talk blog. How did I learn about this outstanding example of collaborative reading promotion? From Stony’s Twitter feed @stony12270, of course. Which members of your faculty will work with you to promote literacy in your community? What about your library student aides? How can they reach out to their classmates and serve as cheerleaders for reading? Here’s an archived example from Emily Gray Junior High/Tanque Verde High School from Teen Read Week: Books with Bite (November 2008)! We can accomplish so much more when we work in collaboration with others. On Thursday, I will share a school library – public library literacy collaboration.